While Trevithick was developing his high pressure steam engines, he foresaw that they could have many different uses. He had now reached his midlife years and they were to be filled with the development of new applications for the existing engines, as well as the development of varied and novel other inventions. In January and May 1806, Trevithick, aged 35, submitted proposals to the lighthouse organisation Trinity House for the dredging of aggregate (for ship ballast) using steam power. They accepted, and he mounted a high pressure engine and a side chain of buckets on the 21.3m long gun brig Blazer. Trinity House loaned the vessel to Trevithick but he later bought it for £300. The 4.5kW steam engine was built at Hazeldine & Co in Bridgnorth and had a 200mm diameter cylinder with a 910mm stroke. Refitting was completed in July 1806 and the dredger worked in September and October on Barking Shelf in the River Thames. It was a technical success. However, the engine couldn't raise aggregate at the rate Trinity House required and, after further trials in December, Trevithick concluded that a more powerful engine was needed. The following year Trevithick, his wife and their four small children moved to Rotherhithe in south London, and he set to work mounting a bigger engine in ex-navy vessel Plymouth. In the summer, this vessel was working on the Thames at Limehouse. By the end of 1807 he had sold both ships to contractor Hughes, Bough & Mills (est.1806). They remodelled the Plymouth, installing a bucket chain on both sides and an 11.9kW engine by Matthew Murray (1765-1826). By July 1808 she was working at Woolwich. In August 1807, the Thames Archway Company sought Trevithick's advice on the driving of a tunnel under the Thames from Rotherhithe to Limehouse. Robert Vazie (b.1758) had started the project as a driftway (small bore tunnel) in 1805. 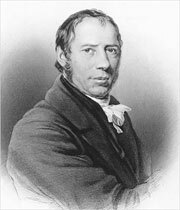 Trevithick was engaged to help him two years later. To Trevithick, raised in the Cornish mines, this was just like driving an adit. The plan was to first complete the driftway so it could act as a drain for the surrounding strata. The drained excavation could then be enlarged. Vazie was dismissed in October 1807 and Trevithick took over. The tunnel reached beyond low water on the Limehouse side by 26th January 1808 but it then flooded. Fortunately all the men working in the tunnel escaped — Trevithick was last out. The tunnel was pumped dry and work restarted but it stopped again on 4th February and all work was abandoned. The tunnel was by then 317.6m long and only about 54m from the proposed end point. The idea wasn't taken up again until 1825, when Marc Brunel (1769-1849, father of Isambard Kingdom Brunel) started work on the Thames Tunnel, which runs from Rotherhithe to Wapping and opened in 1843. After this episode, Trevithick entered into partnership with Robert Dickinson, a patent speculator and West Indies merchant living in Great Queen Street near Covent Garden in London. This led to several joint patents for some of Trevithick's inventions. He set up a workshop in the yard of the house at 72 Fore Street, Limehouse, to which he moved with his family in 1808. The first of the patents (No.3148) was taken out on 5th July 1808. It related to Machinery for towing, driving or forcing and discharging ships and other vessels of their cargo, and In a ship or vessel properly constructed for the purpose, and which we give the name of a nautical labourer, we place a rowing-wheel furnished with floats or pallets, but which we call our propelling boards, and of a size proportional to the vessel. The idea was to tow ships up rivers, lie alongside wharfs and discharge cargo using a steam windlass, but it was abandoned after protests by ship workers' unions such as the Society of Coal-Whippers. This was followed by patent No.3172 (31st October 1808) for iron tanks or Stowing ships' cargoes by means of packages to lessen expense of stowage, and keep the goods safe. The description continues, The improvements now submitted consist in the adaptation to the holds of vessels of a system of wrought or cast iron cases, of a square, polygonal, or any other form, by which they may adapt themselves to each other without leaving any interstices, or made cylindrical where room can be spared. An example was given of transporting whale oil. Ships catch whales and boil the blubber for oil. However, the timber storage casks leak and the wood soaks up a proportion of the oil — and the crew has to wait for the oil to cool before handling it. Iron tanks could be filled with hot oil and wouldn't leak or absorb oil. Metal tanks would also be better for any perishable cargo, such as food or drink. Using iron saved on expensive timber, as suitable cask material was usually imported. The next year, Trevithick and Dickinson took out a single patent (No.3231) on 29th April 1809 for nine separate inventions for Naval architecture and navigation applicable to other purposes. It included iron floating docks, iron ships for ocean service, iron masts and spars, bending timber with steam, diagonal framing for ships, iron buoys, steam engines for general ships' use, rowing trunk and steam cooking. The iron tanks and buoys were to have another use. Since air-filled iron containers float, Trevithick realised that they could be used as buoyancy aids for raising sunken ships. The theory was tested in January and February 1810 on a ship that sank off Margate Sand in Kent. Trevithick, Dickinson, two vessels and a gang of 16 men raised the ship and were towing her to shallower waters when a dispute arose with her owners over the payment previously agreed. Trevithick's temper got the better of him and he ordered his men to cut loose the tanks — the ship sank once more. Trevithick then turned his attention to the propulsion of sea vessels, with another joint patent on 23rd March 1810. This covered Inventions or new applications of known Powers to propel Ships & other Vessels employed in Navigating the Seas or Inland Navigation to aid the recovery of Shipwrecks, promote the health & comfort of the Mariners and other useful purposes. The ideas contained in these patents were not all realised. Possibly they could not be, given the technologies available at the time. It's likely that Dickinson provided most of the considerable financial outlay required but this aspect must have preyed on Trevithick's mind too, as he tried to raise money by selling or mortgaging his mine shares and property. In May 1810, Trevithick fell ill with typhus, complicated by gastric troubles and "brain fever". Typhus was potentially fatal but despite conflicting advice from several doctors, his natural resilience led to a partial recovery in August. Trevithick returned home to Cornwall in early September 1810 with his eldest son Richard, then almost 12 years old. They travelled by sea and Trevithick had to be carried on board as he was still weak. The ship, a Falmouth Packet, was escorted by a gun brig (Britain was at war with France), evaded a French warship at Dover and reached Falmouth six days after leaving London. Trevithick and his son returned to Penponds near Camborne — apparently walking the entire 26km from Falmouth. He was reunited with his family and learned the sad news that his mother had died in July, when he had been too ill to be told. By November he had regained full health and was working on his plunger pole engine and other high pressure steam engines. Further misfortune fell the next year. The London Gazette of 5th February 1811 records that Trevithick and Dickinson "being declared Bankrupts are hereby required to surrender themselves to the Commissioners" on the 16th and 23rd February and the 23rd March. The last appointment was delayed until 4th May. The partnership had debts of £4,000 and Trevithick's possessions were seized, leaving him with no option but to take lodgings in a London 'sponging house' — somewhere between freedom and a debtors' prison. Later in 1811, Trevithick returned to Cornwall where he concentrated on earning money to pay his creditors. Apart from his ongoing work with high pressure steam engines, he created a rock boring machine for the Plymouth Breakwater & Screw Propeller Company in 1812. After a long struggle, Trevithick was discharged from bankruptcy on 1st January 1814. He had managed to pay back most of the debts — at 16s (80p) in every £1 — while his former partner Dickinson paid nothing. Trevithick continued the nautical theme of earlier years with an 1815 patent for propelling steam boats. The patent (No.3922) issued on 6th June described a High Pressure Steam Engine; and application thereof with or without other machinery to useful purposes. The engine used spiral vanes, which revolved at the head or stern of a vessel to produce motion. The patent was augmented by further details on 20th November, including the plunger pole steam engine, reaction turbine or aeolipile, high pressure steam acting via water on a piston and the screw propeller. Now aged 44, Trevithick was about to embark on a great adventure that would take him to South America and leave his family wondering whether he would ever return. 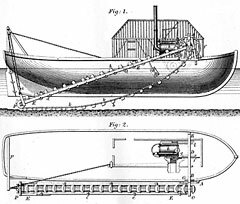 Trevithick designed an arrangement of bucket chain and high-pressure steam engine mounted on a ship for the dredging of river-bed aggregate.